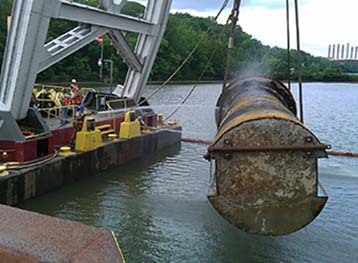 Aquarius Marine located and removed skimmer wall debris which had collapsed during the release of about 5.4 million cubic yards of fly ash and bottom ash into adjacent waterways. Aquarius Marine also removed a portion of the wall that remained undamaged in preparation for a future construction project. The wall consisted of two different sizes of beams, weighing 20 tons and 12 tons, which rested on caissons. The caissons were 8-foot diameter by 30-foot high, and built upon 11-foot diameter by 15-foot high foundations made of concrete and steel reinforcement. In total each caisson weighed approximately 225 tons each. Throughout the job Aquarius Marine made approximately 35 critical lifts ranging in weight from 12 tons to 225 tons. 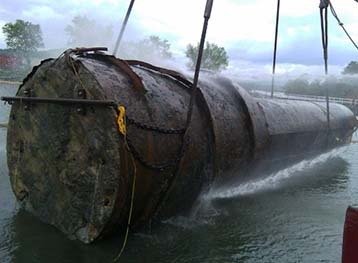 Aquarius Marine’s scope of work also includes mechanical dredging in approximately 40 feet of water in order to locate and uncover the beams and caissons. 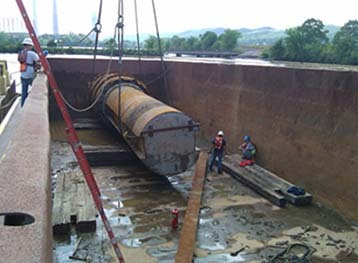 This work was executed in compliance with Tennessee Valley Authority Safety Procedure 802 by certified crane operators. 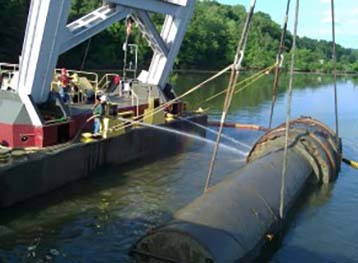 Working alongside Tennessee Valley Authority divers, Aquarius Marine supplied all equipment and rigging necessary to raise and decontaminate the debris. Decontaminated debris was removed from the project site. On this project, Aquarius Marine prepared work plans in compliance with Tennessee Valley Authority / Jacobs Procedure SOP-PM-004. This plan includes a Step Text for each definable feature of work. Aquarius Marine has also developed critical lift plans in compliance with Safety Procedure 721. All equipment on the project site has passed inspection by the Tennessee Valley Authority, Jacobs, and the U.S Coast Guard. All work complied with the TVA Safety Manual and the Site Wide Safety and Health Plan for the TVA Kingston Fossil Plant Ash Release Response.